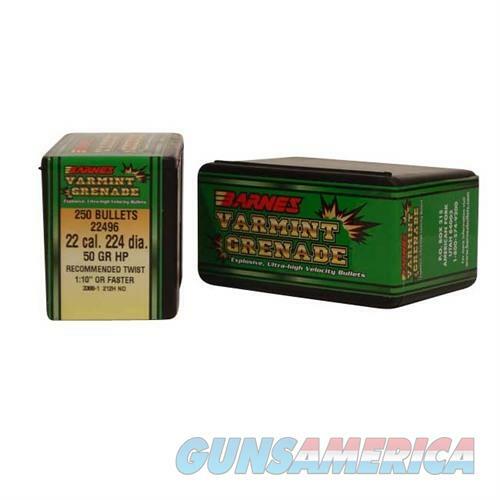 Description: Barnes Bullets 30201 22 Caliber (0.224") 50gr Flat Base 250/Box Varmint Grenades from Barnes are lead-free varmint bullets that deliver explosive results. Originally developed for military applications, the bullet's copper-tin composite core is highly frangible, greatly reducing the chance of ricochets. This flat-base, hollow-cavity bullet remains intact and stabilized at ultra-high velocities, yet fragments explosively on impact. This bullet virtually vaporizes ground squirrels and prairie dogs, even at extended ranges. The bullet blows up completely at high-speed impact, creating little or no exit wounds on larger animals.